There are a couple of events coming up in May that may be of interest to you. Our next stand after that (apart from the possibility of a small table when I am in the signal box) will be at the Bluebell Railway Model Railway Exhibition on the 29th and 30th of June. https://www.bluebell-railway.com/whats_on/events-dates/ This also gives dates of other events at the railway, some of which we will be in attendance for. We have got to where we are with the help of people like you who support us, and thank you for that. We do need to keep the ball rolling though and with the recent expenditure we need to try to keep the coffers full, so if you are able to help us pay for the restoration please do! If you are able to help, please donate only as much as you can afford. The BT My Donate page will be removed by BT on the 30th June. 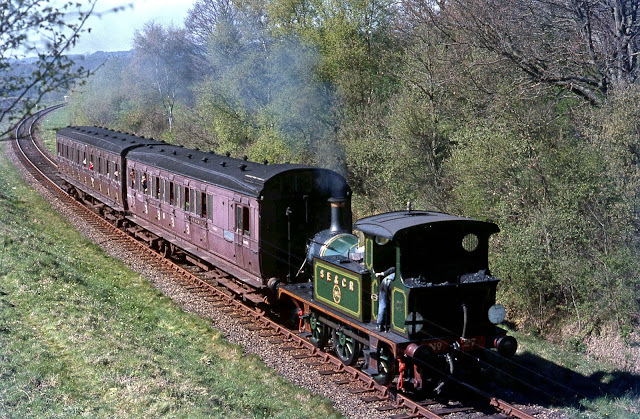 However, we are working closely with the Bluebell Railway Trust who are currently setting up a new donations page. Details will be posted as soon as we have them. These are a few of the pictures I took during a whistle-stop trip on Saturday. 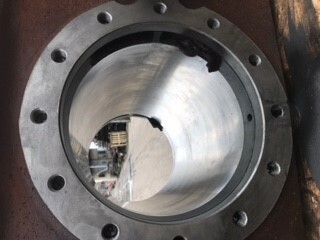 The top of the block showing the exhaust port, upon which will be mounted the Blast Pipe also temporary bolts holding the halves together. The view from the front of the locomotive showing the bolted motion plate and rear buffer beam, together with the riveted stretchers and running plate brackets. 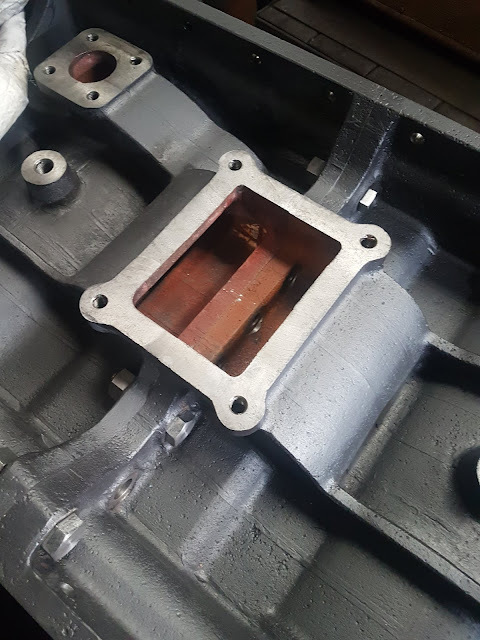 The holes forming a T shape in the brackets are the location holes for the brake hanger housings. This is all that remains of the original drag-box plate, obviously in need of replacement! WE DESPARATELY NEED YOUR HELP TO CONTINUE! The work so far has depleted our funds and to continue to progress at the same rate we need your help. 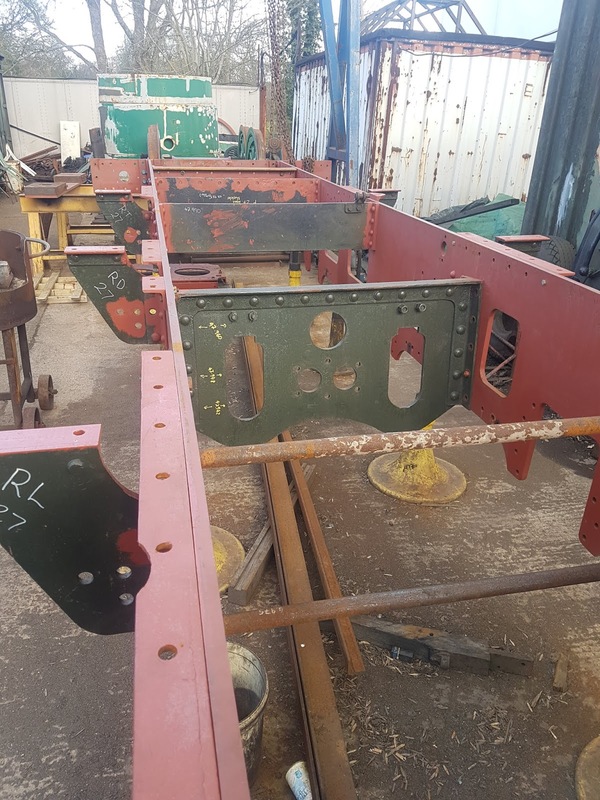 It is expected that by the time we have finished we will have spent in the region of £150,000 on the repair / rebuild / restoration of the loco. We have currently spent in the region of £30,000, so there is still some way to go! This is an important loco in that it served in France during the First World War along with 753 (now on the KESR) and as such became one of the first standard gauge ROD locomotives. 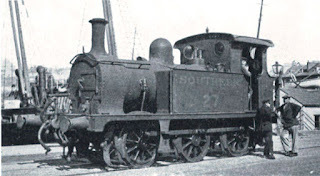 No.27 was also part of the pioneer fleet of locos on the Bluebell Railway, being the second P class to arrive and working virtually continuously from March 1961 until September 1974. This loco deserves to be working again! Matt has sent through some pictures of the work carried out by Ben and him a couple of weeks ago. 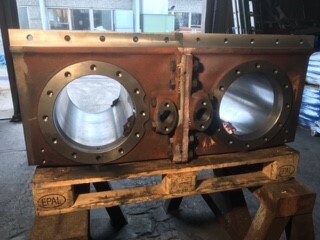 These show the two middle stretchers riveted in place together with the running plate support brackets that have been riveted to the frames on both sides. The frames with the two middle stretchers riveted in place together with the six running plate supports. 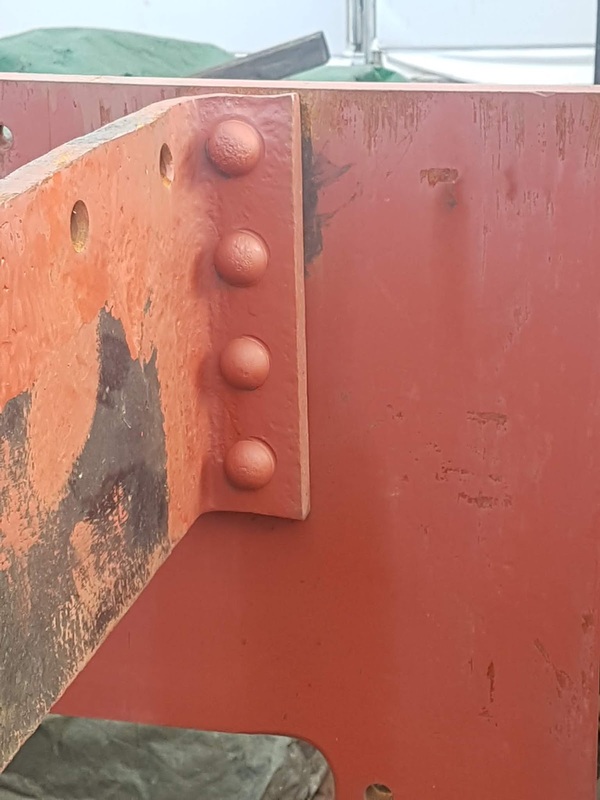 The picture above shows the countersunk rivets that have been used to locate the front running plate brackets. The rivets need to be flush to allow the installation of the cylinders. 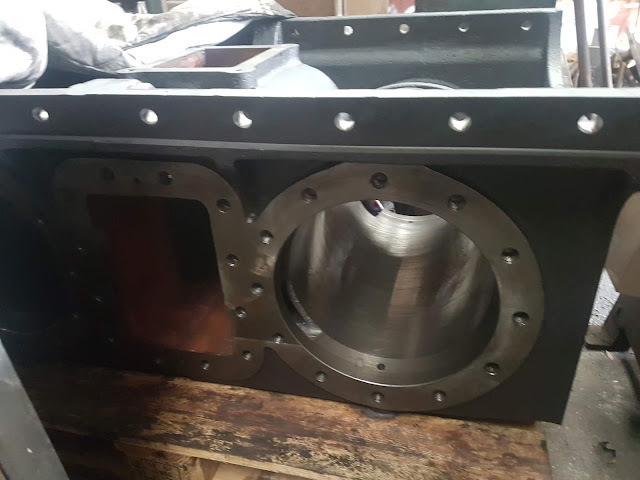 these will be behind the cylinders when they are installed. Further down the frames normal dome headed rivets are required. In the background it is possible to see the new rivets holding the stretcher in place. 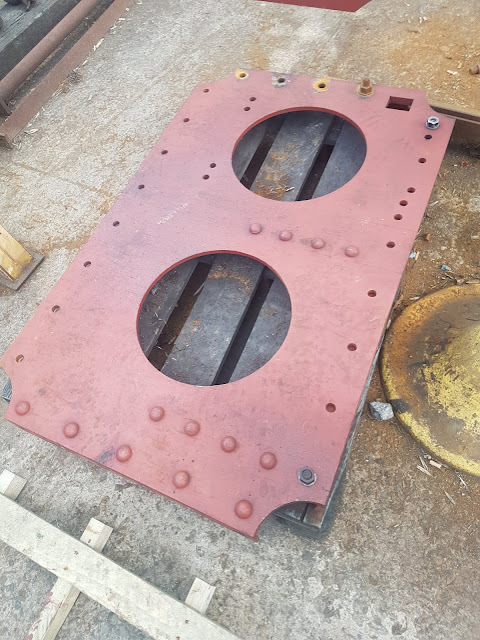 From the outside of the frames it is possible to see the new rivet heads which are securing the running plate support brackets. You may notice the four holes which make a "T" shape. These will locate the top mounting point for the brake gear swinging arms which carry the brake blocks. 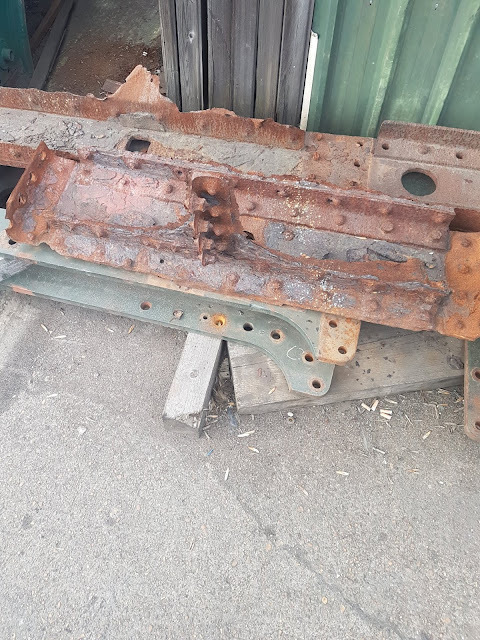 There will be another rivet party in the not too distant future to assemble and locate the rear drag box between the frames and also to add the rear buffer beam. Please look out for future updates which will show this being done. The work so far has depleted the funds to quite a degree and we urgently need to replenish the coffers to allow the work to continue at the rate we have set. There are a few ways to help us. for an instant donation, please donate on line. It is also possible to set up a standing order to give a regular amount via the Bluebell Railway Trust, who can also take one off donations. 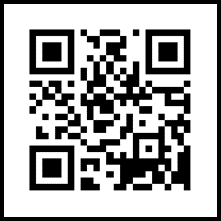 Please add gift aid if you are able when donating via the Trust. We also have a collection jar on the stands we operate on occasions at Sheffield Park for all your loose change (or notes!). We are also now able (subject to getting a signal) to take card payments in person at the stands. 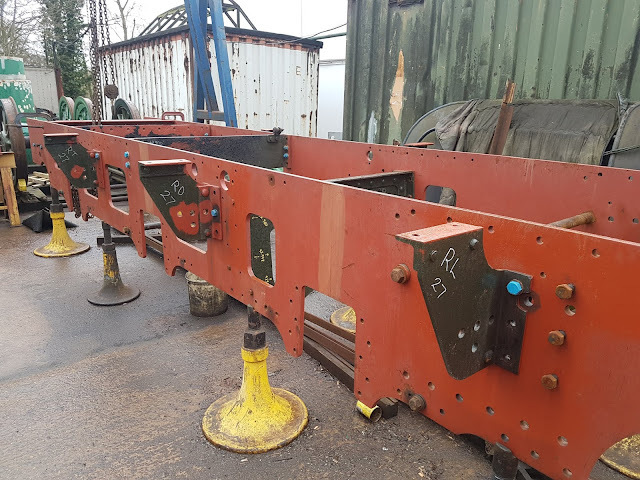 Following a weeks hard work, the two stretchers and the footplate support brackets have been riveted into place. This operation involved Matt and Ben using a week of their annual leave to carry out the reaming and riveting up. 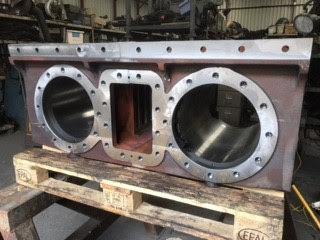 Work will now concentrate on the completion of the rear drag box and reaming the holes before riveting takes place to fix it between the rear frames. There will be some pictures posted shortly. 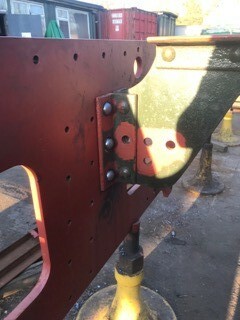 Other riveting operations include the location of the horn guides either side of the openings in the frames. 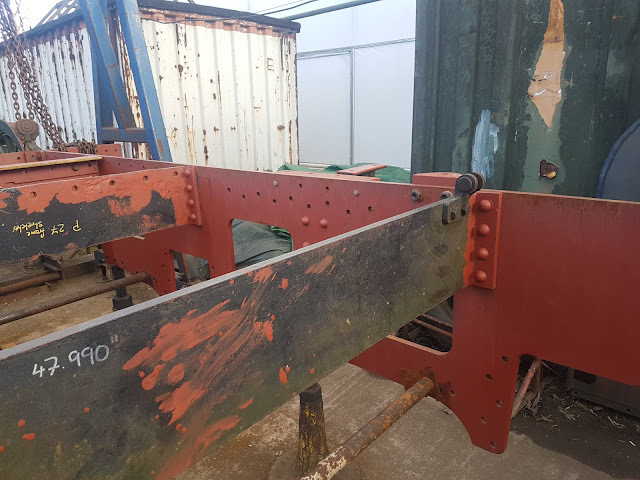 Once the riveting has taken place a small amount of cleaning up will be required before painting of the frames can be carried out. The usual treatment of bonder primer, undercoat, top coat and varnish will be applied. 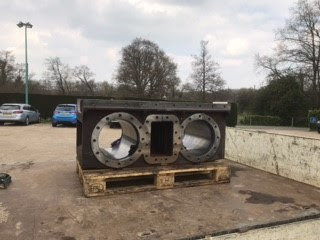 The cylinders have now been returned from Statfold Engineering to Sheffield Park, where they are in store awaiting final fettling before being located between the front of the frames. 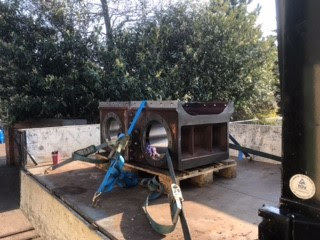 The machined castings were collected by Matt and Ben late on Friday and unloaded at Sheffield Park on Saturday. Again pictures will follow shortly. Following a good two days at Branch Line Weekend, we are looking forward to our next fundraising opportunities. 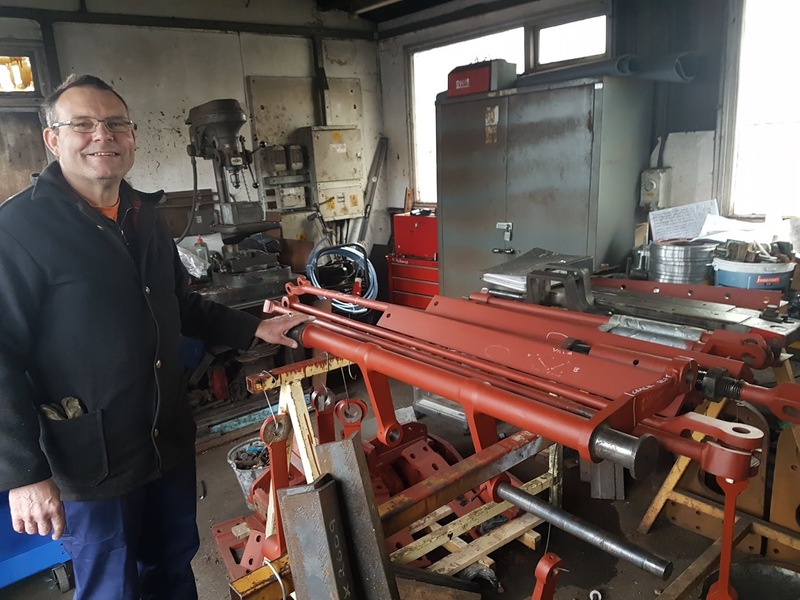 The first will be a small table outside Sheffield Park Signal Box on the 27th of April when Clive is signalman for the day. Following that, we will be at the Haywards Heath Model Exhibition on the 11th of May. https://haywardsheath2019.wixsite.com/hh2019 We hope to see you there! We have access to a machine for card payments and donations at Sheffield Park, and hopefully at other venues, depending on connectivity! There has been a fair amount of progress on the frames and parts that are to be bolted or riveted onto the frames in the last few weeks. As we reported a couple of weeks back, the frames are now erect and bolted up. These bolts are temporary to allow the squareness and levels to be adjusted. Riveting has now been scheduled and this will commence in a couple of weeks with a hope for a rapid conclusion to the process. 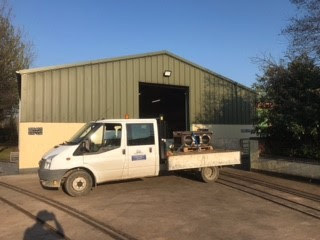 The work is to be carried out by some of our volunteers, led by Matt and Ben, who are taking time off work and giving their time freely to help out. 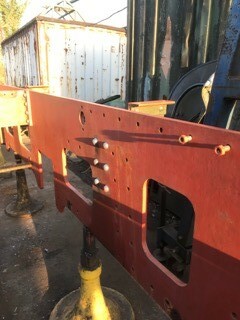 The bolted up frames with the footplate brackets also added. ﻿All of the bolts seen in the picture are temporary and will be replaced with rivets. 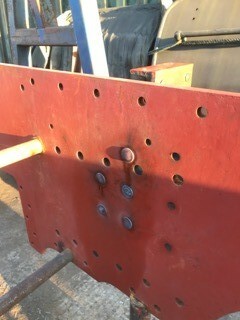 There are also many more holes that will be home to rivets. Other works that have been carried out include cleaning up of various parts that go between the frames. 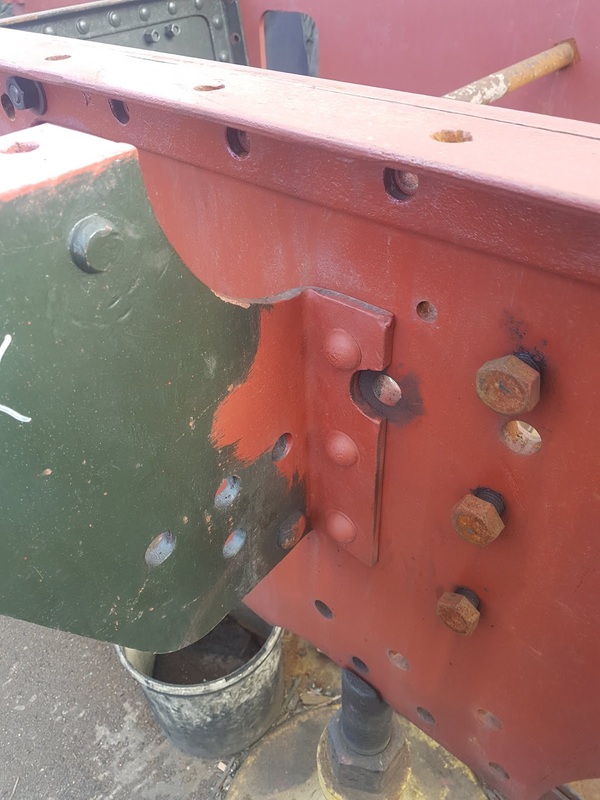 These have been given a coat of bonder primer to protect them, whilst any bearing surfaces have been protected with oil impregnated bandages. Sean Smeeth posing with some of the motion and brake rigging. Later in the day he cleaned and painted the brake shaft. The work on these parts is on-going and will be top coated before they are installed between the frames. Again there is plenty more to be done before too much assembly can take place, although this should not take too long in the scheme of things. 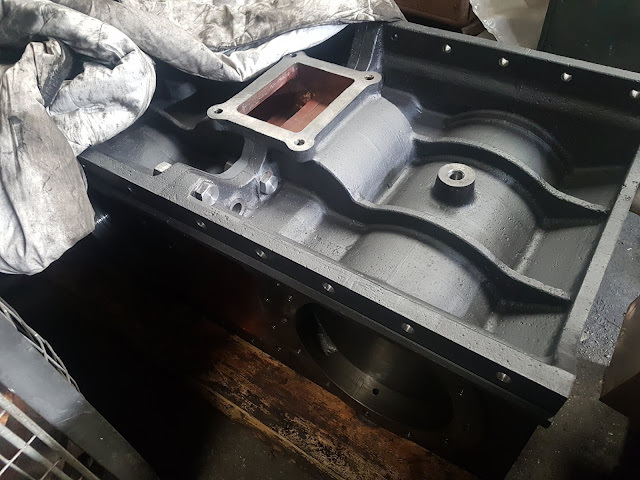 The brake shaft before cleaning and painting took place. 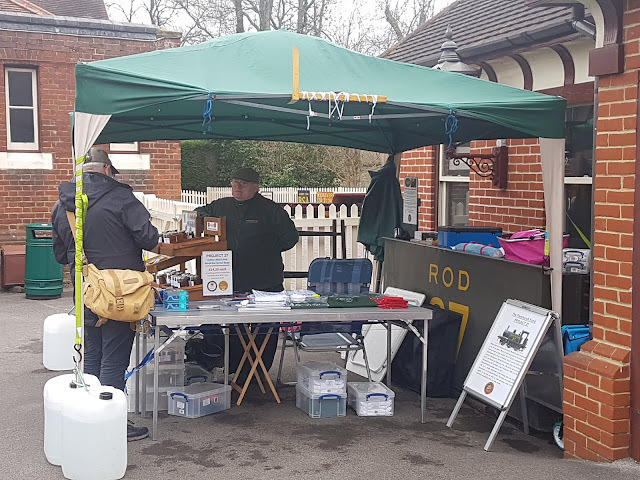 During the Branch Line Weekend we braved the elements on the platform at Sheffield Park with our sales and information stand. Even allowing for the weather our efforts paid off handsomely over the two days. We did loose a gazebo to a sudden gust of wind on Saturday, but there were no injuries so we left on a fairly positive note! On Sunday the weather was less gusty and we did even better than Saturday. The gazebo with a minor temporary repair before the structural damage later in the day! Due to the weather we were unable to get our full range out, but had a selection of items to sell. We would like to thank all of our customers who braved the elements to support us. Our thanks also go to Andrew Waller who travelled down from then midlands to help us out for a few hours, and thanks to him also for the donation of some stock to sell on the stand. 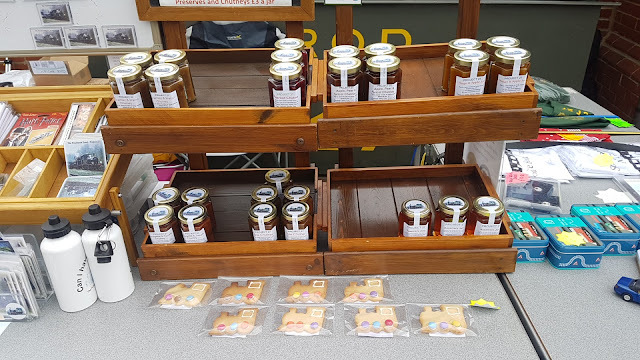 The stand on Sunday was a little fuller and our customers were also able to spend more time speaking and buying, indeed we almost sold out of pickles and preserves! The stock dwindled on Sunday! Just a quick reminder that we will be at Sheffield Park on Platform 1 this weekend for the Bluebell Railway Branch Line Weekend. If you are about, why not pop along and support us in our endeavours to return SECR No.27 to traffic. 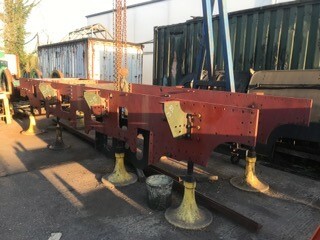 We will have plenty of stock and news for you, it may be possible to see the loco being worked on in the yard (this depends on Atlantic House being open). I am sure you would like to see the loco working as much as we do, and to help us to reach the stage of a working locomotive, we need all the help we can get! Please donate as much as you can afford, no matter how small, it all makes a difference. Or if you have items that you would like to donate for our sales stands or items suitable for auction (model railways or railwayana, we would be pleased to receive them. If you would like to make a regular donation, please ask for a Standing Order form by email to the address below, please also use this address for enquiries and offers of physical help.